The Columbia Disaster changed my personal and professional life dramatically. The morning of the accident a fellow Federal Aviation Administration (FAA) employee called me from the Cape; he said the orbiter was 30 minutes overdue and suggested I pack my bags. Within a week I was in Houston, meeting Admiral Gehman and the rest of the Columbia Accident Investigation Board (CAIB) members. As the leader of the flight safety analysis team for the Office of Commercial Space Transportation, I was one of two FAA employees selected as an investigator on the Independent Analysis Team (IAT). The CAIB put so much value on independent analyses that we had an IAT inside the CAIB, which was itself an independent safety organization. Mostly I worked on the technical analysis of the accident performed by “Group 3” and directed various independent analyses funded by the CAIB, such as the foam impact analysis performed at the Southwest Research Institute (SwRI) and the public risk study. As an example of CAIB thoroughness, the SwRI analysis supplemented at least three other technically separate analyses performed by Boeing, NASA, and the Sandia National Laboratory. For six solid months after the Columbia disaster, the CAIB worked seven days a week, starting with an all-hands staff meeting every morning except Sunday, at 0700. 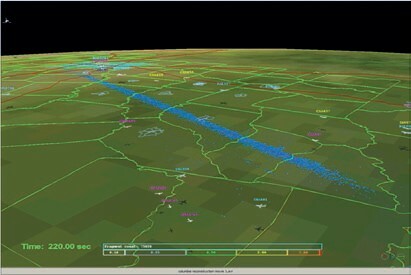 Simulation of Breakup during the Columbia Disaster to Compute Probability of Impact on Aircraft (Credits: ACTA inc). Mr. O’Connor’s recommendation started me on a more challenging quest than I had realized. My first step was to speak with Steve Wallace, Director of the FAA’s Office of Accident Investigation and a CAIB member, about the potential public safety implications, which he agreed were of interest. However, the CAIB was still entirely focused on the cause of the accident, so not much energy went into a public safety investigation until after NASA briefed the CAIB about the Probabilistic Risk Assessment (PRA) for the STS program, which was almost ready for publication just prior to the accident. Toward the end of that briefing, I asked about the potential applications of the PRA to public safety. The response was that NASA would not apply PRA insights to any public safety applications because the United States Air Force (USAF) and FAA were responsible for public safety during launch and reentry, respectively. As an FAA employee, it was clear to me that at least some people at NASA had the wrong impression about responsibility for public safety during reentry. After the PRA briefing, Steve Wallace agreed that the public safety issues demanded a thorough investigation. And they got one. 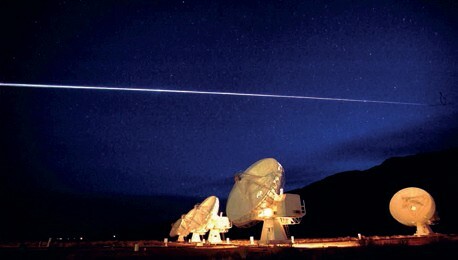 Space Shuttle Columbia streaking over the Very Large Array radio telescope in Socorro, New Mexico (Credits: NASA). CAIB directed an independent study of the public risks posed by the Columbia disaster, which was performed by ACTA Inc. and documented in Volume II of the CAIB final report. The results demonstrated a 10-30% chance of one or more casualties on the ground given that the accident happened when and where it did. Thus, the absence of serious injuries to people on the ground due to the Columbia accident was the statistically expected outcome, not “a miracle” by risk analysis standards. However, the populous city of Houston would have been hit if that fateful reentry was delayed one orbit. The probability of casualty was much higher, 89-98%, if the same debris field fell on Houston, with two casualties expected. CAIB published preliminary results on the conditional risks to aircraft: the expected number of plane impacts from debris resulting from the Columbia disaster was approximately 0.03 based on estimated air-traffic nearby. A subsequent FAA study used the actual commercial aircraft trajectory data at the time of the accident to compute between 0.003 and 0.1 expected collisions of Columbia debris with commercial aircraft [see AIAA 2005-6506]. The highest probability of impact to any individual aircraft was between 1 in 1,000 and 1 in 100, depending primarily on the uncertainty associated with how many small fragments survived to aircraft altitudes but were unrecovered. The consequences of an aircraft impact with Columbia debris was highly uncertain, but the fact that over half the recovered debris was under 0.5 kg and extremely low density materials suggested that many would have been benign even if they had impacted. CAIB published a section on public safety (10.1) in Volume I that called out NASA for failing to follow public risk standards already in place at other flight institutions. “FAA and U.S. space launch ranges have safety standards designed to ensure that the general public is exposed to less than a one-in-a-million chance of serious injury from the operation of space launch vehicles and unmanned aircraft,” reported CAIB. “NASA did not demonstrably follow public risk acceptability standards during past orbiter reentries.” The findings concluded that NASA needed “a national policy for the protection of public safety during all operations involving space launch vehicles.” Columbia became a part of this policy development, with the recovered debris from the orbiter used to facilitate realistic estimates of the risk to the public during orbiter reentry. Physical Test to Simulate Foam Impact on Columbia’s Wing Leading Edge performed during the investigation following the Columbia disaster. An air gun is used to launch a 757g foam piece into a Reinforced Carbon-Carbon test article at a speed of 234 m/s, with a 20 degree angle of incidence. Inset: the test article a fraction of a second after being impacted (Credits: Rick Stiles/ CAIB). The impact of the Columbia disaster on aviation safety cannot be overstated. In the wake of the accident, multiple US agencies collaborated to develop consensus based aircraft protection standards and models to characterize aircraft vulnerability to launch and reentry debris. The Columbia disaster prompted NASA and the FAA to develop and implement a real-time mishap response system to alert aircraft and rapidly clear potentially threatened airspace during subsequent Shuttle reentries [see AIAA 2010-1349]. The FAA is currently expanding the real-time aircraft warning system, based on containment for debris that exceeds aircraft hazard thresholds, to more efficiently integrate launch and reentry vehicles into the US national airspace without compromising safety. The FAA continues to sponsor tests and analyses to produce more refined aircraft vulnerability models. These tests and analyses are part of the ongoing efforts to ensure no space vehicle debris collision will cause an aircraft accident the way the foam strike destroyed Columbia. In the video below the vehicle breakup, the culminating moment of the Columbia disaster. Dr. Paul Wilde is a founding fellow of the IAASS with 20 years experience in safety standards development, launch and reentry safety evaluations, explosive safety analysis, and operations safety. Currently a technical advisor for the Chief Engineer in the US Federal Aviation Administration’s Office of Commercial Space Transportation, he preformed leading roles for multi-organization projects in high-profile situations, such as investigation of public safety issues and the foam impact tests for the Columbia Accident Investigation Board, flight safety evaluations for the maiden flights of the ATV, Atlas V, Delta IV, Falcon 9-Dragon, Spaceship 1, Titan IVB, and the development of US standards on launch and reentry risk management. He received the NASA Exceptional Achievement Medal and is a licensed professional engineer in Texas. This article was first published in Space Safety Magazine Issue 6, Winter 2013 on the occasion of the 10th anniversary of the Columbia disaster.